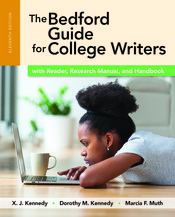 Both reliable and innovative, The Bedford Guide for College Writers plunges students into active learning right from the beginning, whether their writing class meets on campus or online. This new edition expands active learning into reflection, helping students engage with their own writing process to gain a deeper understanding that will serve them throughout their writing lives. The Guide contains a process-oriented rhetoric, a thematic reader, a research manual, and a handbook, giving students everything they need for success in writing, all in one affordable book. Students are provided frequent opportunities to experiment and apply the skills presented, including Learning by Doing activities, Responding to an Image practices, and engaging assignments that all help students make important writing skills their own. The Bedford Guide helps students to be the confident, resourceful, and independent writers they will need to be. With an expanded Launchpad full of activities built to enhance the book’s content online, reading comprehension quizzes, diagnostic quizzes and much more, the eleventh edition extends active learning online, offering students more opportunities to build deeper awareness of their own writing processes.